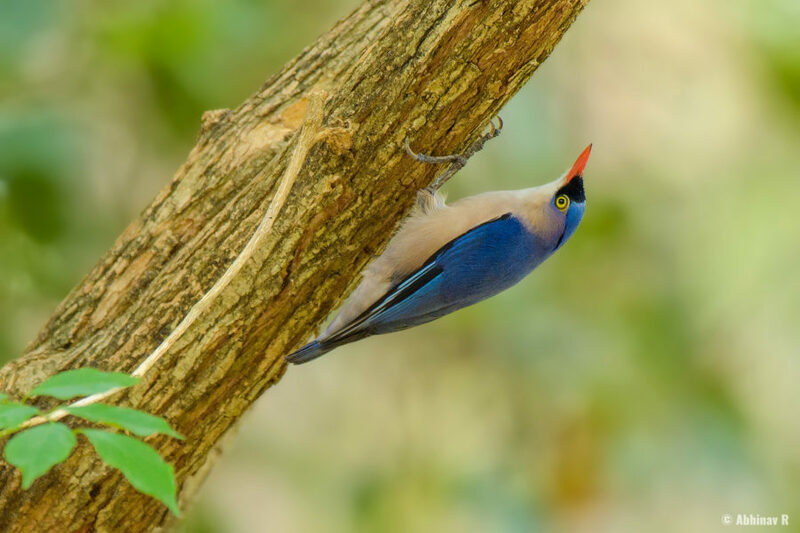 Velvet-fronted Nuthatch is one of the two nuthatches of southern India. The other one is Chestnut-bellied Nuthatch, which is less common. Like all nuthatches, it is an interesting bird because of its ability to climb trees downwards with head also pointing down. This photo of the nuthatch is from Chinnar Wildlife Sanctuary in Kerala, India. The bird is quite common here. It was a bit difficult to capture this due to its restless behaviour – it kept on moving upwards or downwards the stem all the time. We found this near Alampetty eco shop while returning from Thoovanam waterfalls. In this photo, as you can see, it was creeping up the stem. I was able to get a nice image of the White-browed Bulbul also from the same place. Appearance and behaviour: Velvet-fronted Nuthatches have violet-blue upperparts and head. The forehead is black and bills are red. The underparts vary from white to warm white. The throat and chin area are also whitish. Eyes are yellow. The male bird has black stripe above the eyes. Female lacks this. The legs are big and sturdy enough to creep easily on trees. These nuthatches are very active and the often hang from trees in an upside down posture. Move from trees to trees quickly and call often. Size: It is a small bird with size around 12 cm. Habitat and Distribution: Main habitat is the forests. Moss covered trees found in shola forests are one of their favourites. These birds are found in various parts of south and South-East Asia. In South India, they are often seen in the forests of Western Ghats. Family: Sittidae (the family of Nuthatches).